Use Netgear Express to quickly transfer data from your NAS devices to the cloud account. The express device is a temporary storage device shipped to you by IDrive. Your data is protected during transfer and storage using 256-bit AES encryption, with an optional private key. Go to the 'Express Backup' tab in the Netgear Backup app page. Select the express device, from 'Local Backup Location' drop down menu, to which you want to backup your data. Select the files/folders for backup. The selected files/folders appears in the 'Contents of Backup Set' section. 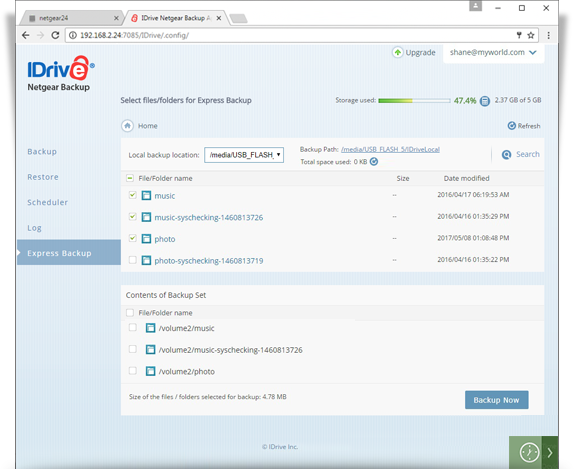 Click 'Start Backup' to start the express backup operation. 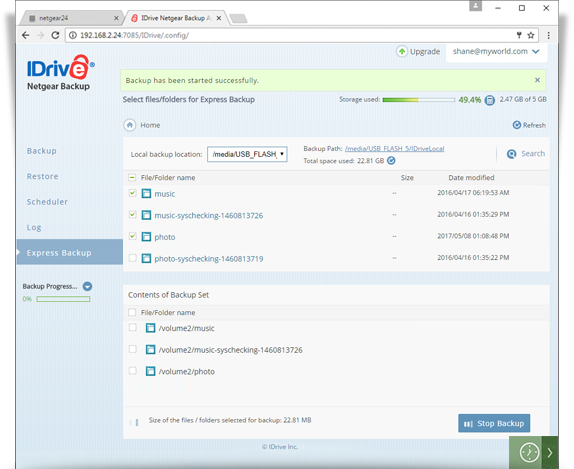 Click 'Stop Backup' to terminate an ongoing express backup operation. Note: You can exclude individual files/folders (for e.g. file extension like tmp), which may be part of the backup set, from being backed up to your account. From the 'Select files/folders for Express Backup' list, click the drop-down arrow against the respective file/folder and click 'Add to Exclude List'.